Hello, my name is Jason. I am a family member of someone that suffered from an addiction. I was asked to give a brief message about how I came to the group and how it has impacted my life. With that in mind I will start at the beginning. In July of 2012 I filed for divorce from my wife. She developed a prescription drug habit after surgery. 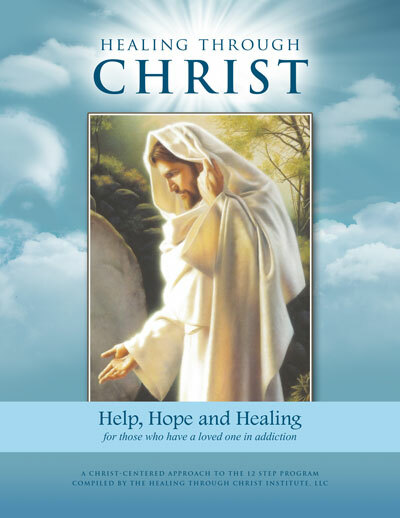 When I filed for the divorce I had no clue the Healing through Christ Program existed. No one had ever talked about it. So I thought I was using “tough love” to try and force my wife into recovery. In September of 2012 the divorce was final. I was heartbroken. I thought my wife didn’t love me enough to get help. I thought I didn’t do enough to get her the help she needed. In July of 2013 she was found dead in her bed by her niece from a drug overdose. I feel into a deep depression. I thought about ending my life for a time because I hadn’t done enough, because I couldn’t save her. After her funeral I left the church. All anyone at the funeral could say was “She finally beat her addiction.” I went inactive. I didn’t want to have anything to do with the church. I thought there could have been more done to save my wife and the church was just as much to blame as I was. Through my inactivity I was emailed regularly by a member of the church. He had gone to the branch where my wife and I attended. He was polite and didn’t push. But I was angry and didn’t want to have anything to do with the church or its members. December of 2015 I was very depressed. I was lost. I was unhappy and searching for something to make me feel happy again. I was praying for help but not really believing I would get it. In late December or early January 2016 this Brother reached out again via email. He asked me to go to breakfast. He just wanted to catch up and talk. Not about church or why I wasn’t attending. I said yes. Halfway through the breakfast I was in tears and telling him everything. I told him about my grief, my anger with the church, my guilt over my wife’s death. He listened to it all. He didn’t judge me. What he did do changed my life. He told me there was a program called Healing through Christ. He told me that it was for family members of those with addictions. He told me I didn’t have to go to church but if I wanted to go to the meeting he would go with me. I wanted to go. This Brother told me the time and place of the meeting and met me there. He even purchased my manual. He attended with me for a few weeks until I felt comfortable. Today I am a facilitator of my group. Today my heart is whole. I have peace. I am happy. I have learned through this group about my role in my wife’s addiction. I have learned about the things I could control and those I could not. More importantly I have learned to forgive myself. I have learned to deal with my emotions in a safe and healthy way. I have learned that I too suffer from an addiction. I have learned that I too can rely on God and his promise to be there for me when I turn to Him for support. Through coming back to church I have been able to strengthen my testimony of this church. I have been able to testify of my progress in this group and how it has changed my life. I am currently dating a wonderful woman who gained her own testimony of this church. She has a testimony of seeing how this group has affected my life for the good. She was baptized a member of this church in March of this year. In closing, my first step was praying and asking for help. My second step was accepting an invitation to breakfast. I urge any and all church leaders to make sure all members are aware of this program. I urge you to attend a few meetings with those members who are seeking help. An invitation to go to a meeting means more, and may accomplish more, when it is accompanied by the offer to go with them. When I arrived as a new missionary in Lille, France, the missionaries of my zone were planning a bicycle trip to visit the WWI American Military Cemetery of Flanders Field and had already secured our Mission President’s permission as we would be traveling outside of our zone. My 3rd day in the mission field, I purchased my bike, a beautiful green Peugeot 10 speed, and on my 1st or 2nd P-day, we were on the road. The topography of Western Belgium is very similar to the ground between Kalamazoo and Grand Rapids–gentle rolling hills of fertile farmland. Almost immediately as we left the bumpy, slow-riding cobble-stone streets of town, I found myself at the end of the line of riders. Sometimes a very long line with them massed at the front and me far, far behind. I was not riding at the end to make sure everyone else was ok. I simply couldn’t keep up. The other missionaries were constantly having to stop and wait for me. They never said anything mean or derogatory, but every time I rolled up to them standing patiently beside their bikes, I felt embarrassed, weak and inadequate. With the day passing faster than the miles and my frustration probably evident on my face, several missionaries slowed down to ride beside me. After a time, one of them suggested we stop and raise the seat on my bike. In my emotionally vulnerable state, I could have snapped back that I knew how to ride a bike. Fortunately, I swallowed my embarrassment, and we raised my bike seat about an inch. At first, I felt uncomfortably high but found to my delight that with every pedal-stoke I had more power in that last inch and had a split-second of rest with my leg almost fully extended. The other missionaries were still more accustomed to bike riding, but now I could pedal faster, longer and I could keep up. Brothers and Sisters, we all will have challenges in this life that will give us opportunities to become more Christ-like. Some of those challenges will be times of weakness and pain to teach us faith, obedience, diligence, humility and forgiveness. Some challenges will be times of strength and plenty to teach us faith, obedience, gratitude, compas- sion, and charity. Sometimes we choose these challenges by our actions. Other times our challenges are the result of mortality or the choices of others. In both times of personal weakness or of personal strength, it is vital for us to remember that God has a greater purpose for us than the joy or sorrow of the moment. I am grateful for the few moments of focused attention my missionary associates gave to me on that bike ride long ago. Both they and I were immediately blessed for their gift. In our life-goal of becoming more like God, we cannot afford to nurture feelings of anger, jealousy, or resentment. The Savior tells us that the greatest commandment is to love God and the second is like unto it: to love our neighbor as our self. When we refuse to forgive, we slow our own progression as we falter in keeping the second great commandment to “Love our neighbor as ourselves.” (Matthew 22: 37-39). However, “forgiving” does not mean we allow ourselves or another to continue to be abused. It does mean that we leave to God all issues of fairness or punishment while we move on to greater things. It does mean that we focus on improving our future rather than on how we were treated in the past. We make judgments all the time, and almost always our judgments are based on faulty or incomplete information viewed through the distorted lens of our perceptions of the world around us. I assumed that the missionaries of my zone were impatient and irritated with me because I felt that way myself. Whether or not they were, they clearly spent some time trying to figure out if they could help me. We would be wise to always judge or interpret the actions and words of others in the best possible light we can imagine. We may be wrong occasionally, but I believe we will all be happier if we assume others have positive intentions.